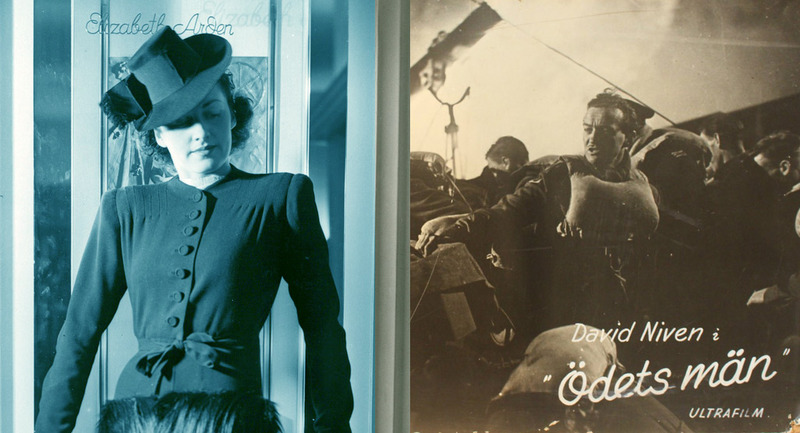 Hjordis Genberg modelling for Leja in 1941, and a promotional Swedish postcard for David Niven’s 1944 movie ‘The Way Ahead’. (The Hjordis photo is courtesy of the Nordiska Museet). Hjördis spoke and wrote at some length about her adventures in the first half of the forties, but rarely referred to the war that surrounded her country on all sides. 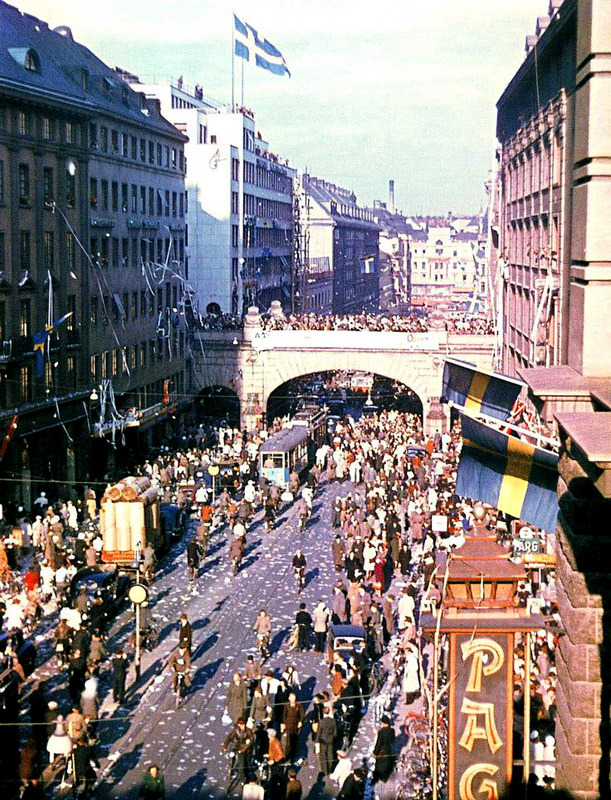 She told Woman’s Own: “Being Swedish I was a pro-British neutral”, and only alluded to its effect on her life, such as expressing shock at the amount of food freely available during her first American visit in December 1945. Apart from a frustrating inability to travel, Hjördis’ rapid success in Stockholm between 1941-1945 may have helped to make the war feel like a fairly distant backdrop. One person who wrote at length about life in wartime Sweden was Stockholm housewife Astrid Lindgren, who kept a detailed diary of her hopes and fears, along with observations on everyday life. (Astrid’s diary has been published in English as ‘A World Gone Mad’. She is better known as the author of the Pippi Longstocking books, the first of which was published in 1945). 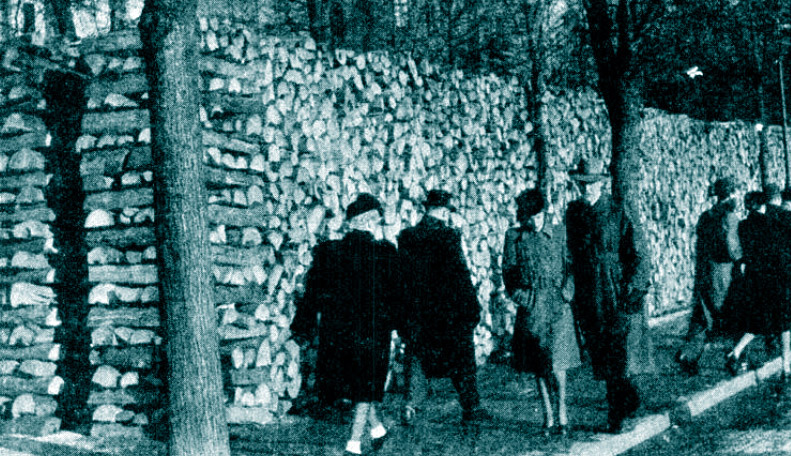 Astrid recorded that Germany’s invasion of Poland on 1st September 1939 triggered a sharp increase in stockpiling among the Swedish population: “The amount of hoarding is unbelievable.” Food rationing was threatened and then quickly introduced, although the products in question and the amounts allowed fluctuated in the following years. On 2nd September, Astrid noted that people on the streets of Stockholm looked: “Pretty much the same as usual, only a bit more gloomy.” Despite the fact that the first shots of the Second World War took place a mere 120 miles from Sweden, it was the Soviet invasion of Finland on 30th November 1939 that made the war feel close to home. “Germany will have to take the blame in perpetuity for letting the Russian barbarians loose in Europe,” a terrified Astrid wrote in December. Stories of Soviet atrocities in Finland and the Baltic states reached Swedish ears long before the horrors of German occupied Poland. 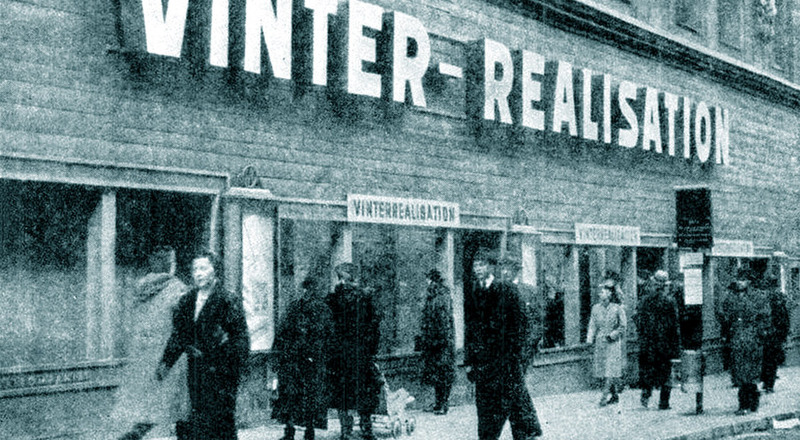 Boarded-up shop display windows in wartime Stockholm. The city was felt to be in danger of bombing raids. The worst that happened was an accidental raid by Russian bombers which hit a suburb in 1944 – ironically during a black-out exercise. 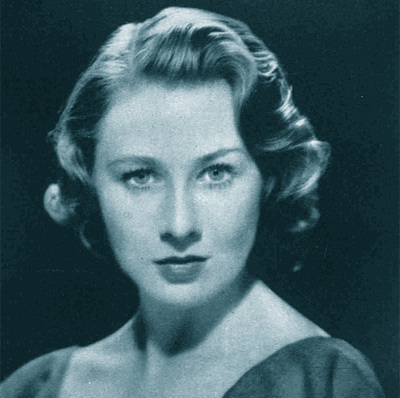 Following the German invasions of Denmark and Norway in April 1940, the stream of atrocity stories began to flow from Norway as well as Finland, aided (bravely at the stage of the war) by the Stockholm daily Dagens Nyheter, which Astrid noted took every opportunity to air their anti-Nazi views. In 1940, news reached the population that Germany was demanding to be allowed to transport troops through northern Sweden. It was an unpopular arrangement that the Swedes only felt strong enough to stop in October 1943. In Vivsta, 20 year-old Hjördis Genberg must have been aware of a general mobilisation taking place in Norrland, and a blackout imposed “until further notice”. However, when her father succumbed to cancer in August 1940, the war may have just felt like a dark sideshow to his illness. 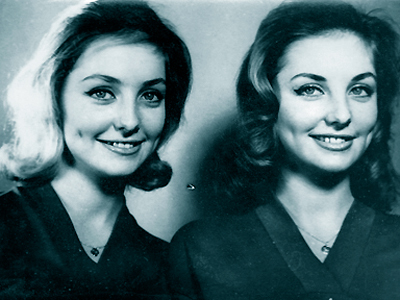 Life went on for Hjördis, and by 1941 she and her sister Ann-Marie had moved to Stockholm, where Hjördis eventually landed a position as a student model. Foodstuffs were rationed but still needed to be bought. Hjördis mentioned that for a time she and her sister could barely afford to eat anything. The greatest shortages were of coal and oil, both of which needed to be imported. Germany was well aware. German obstruction was circumvented by something that Sweden had in abundance. Trees. Forests were utilised to provide charcoal and wood gas as a substitute for petrol. 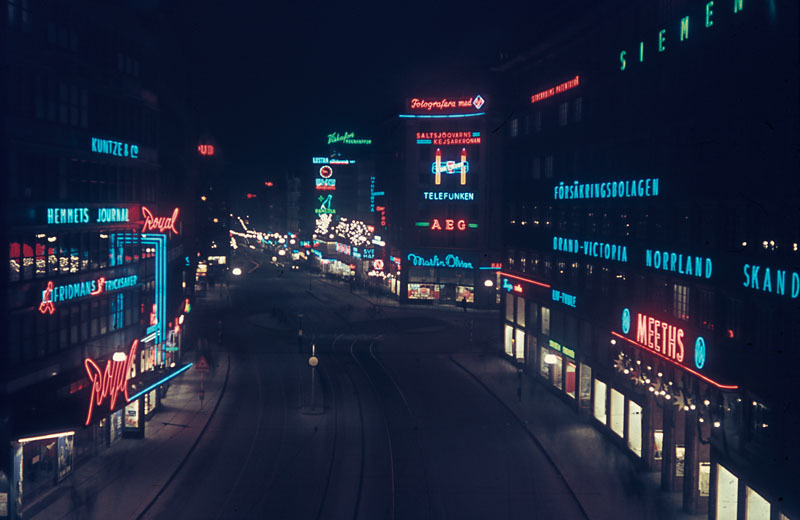 A quarter of Sweden’s 275,000 cars were running again by 1943. And that was despite the Germans stopping their “safe conduct by sea” policy for Swedish shipping between January and May. Swedish advert for Orancia – an orange drink. Fruit was not rationed in 1944, with Spanish oranges cheap and plentiful. Not all restrictions were in place because of the war. Sweden’s answer to Prohibition was the Bratt System, which had been introduced in 1917 to control (though not eliminate) alcohol consumption. 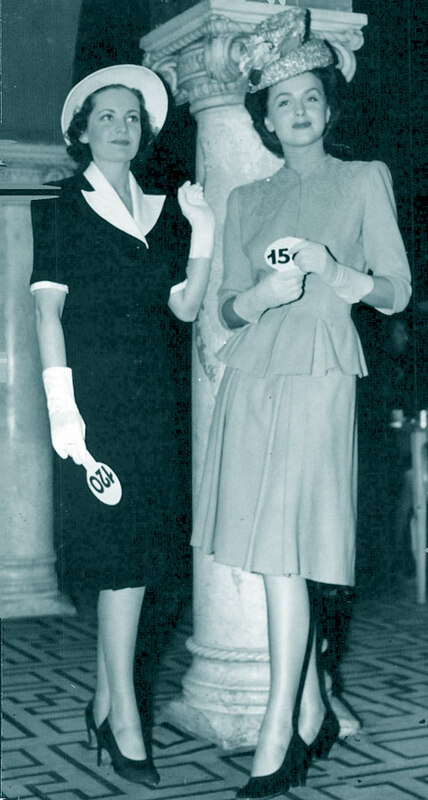 Hjordis Genberg modelling at a Swedish Red Cross event, held at the Royal Cinema in Stockholm, 9th May 1944. In addition, spontaneous dancing could only take place in a few registered venues: “Recently the Swedish Government has become concerned about the morals of the younger generation. Sweden has tightened up on dancing.” Only six licenses were handed out in Stockholm, which authorised two tea dances or dance-related evenings per week. [Talking of tea, it was made out of apple leaves in wartime Sweden]. Fear of Nazi Germany meanwhile turned to revulsion, as news of excesses in Norway and Denmark continued to pour in. Charities such as the Swedish Red Cross became more and more active. 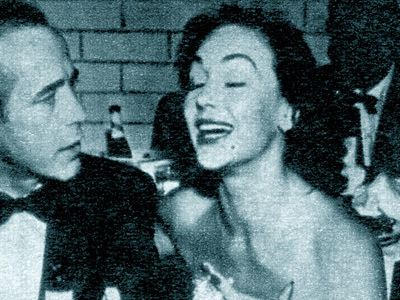 In May 1944, Hjördis was one of the NK models to take part in a fund-raising party at Stockholm’s Royal Cinema. In 1945, Swedish royal Count Folke Bernadotte fronted the Red Cross in flying to Germany to arrange the release and rescue of concentration camp prisoners. 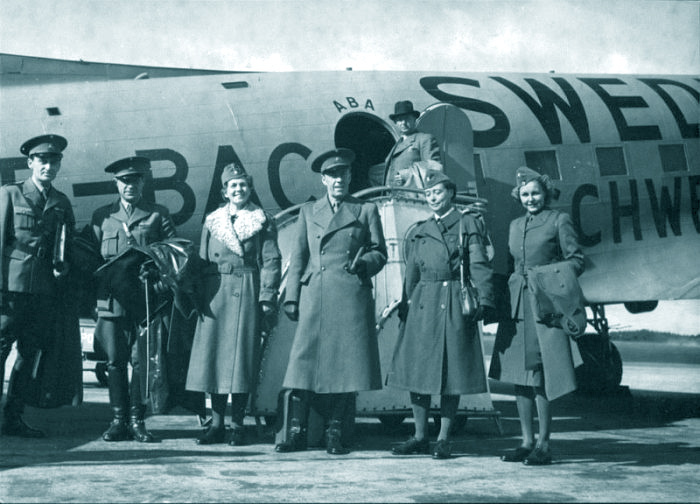 Swedish Red Cross delegation with Count Folke Bernadotte, in front of an ABA aircraft – painted orange with “SWEDEN” in large letters. ABA (AB Aerotransport) kept their service running by using converted Boeing B17 Flying Fortress bombers, stripped of arnament, which could fly higher and further than the unfortunate aircraft they replaced. The destination airport in Aberdeen had to be swapped for Prestwick, near Glasgow, which also provided an onward connection to America. Hjördis and her fiancee Carl-Gustaf Tersmeden lost no time in seeking to expand their horizons beyond a Sweden described in a US magazine as “almost hermetically sealed from the outside world by Axis-dominated neighbours”. Carl had worked for ABA until early 1945, when he joined his family’s wood pulp company to prepare for travelling to the Americas on their behalf. By November, when coffee, tea, cocoa, petrol and tobacco rationing ended, he had already left for Brazil. (Brazil fought on the Allied side from 1942, after suffering heavy loss of life off its coasts due to Axis submarine activity). Ironically, shoes and fabrics came off the Swedish ration list on 26th November 1945, less than two weeks before Hjördis halted her modelling career and sailed to join up with Carl in Baltimore. The wider world beckoned. Hjördis would never live in Sweden again. Next page: Mrs Hjördis Tersmeden or take another quick detour to Swedish fashion in the 1940s.